History: (Eternals II#1 (fb) ) - At some point in the past Druig fought alongside the other Eternals against the Deviants. (Thor Annual#7 (fb)) - One thousand years ago, Druig, alongside his fellow Polar Eternals Valkin, Virako, and Ajak, encountered the Asgardian Thor. Druig devised a Neutralizer Helmet with which he intended to subjugate Dromedan. However, he underestimated Dromedan's power, and fell under his thrall instead. His father Valkin never learned that he was responsible for setting Dromedan free. (Eternals I#11) - In modern times, during the visit of the Fourth Host, Druig had adopted the identity of an officer in the K.G.B. With his fellow Polar Eternals, he answered Zuras' summons to a Uni-Mind at Olympia, although he confessed then that he was no hero. (Eternals I#17-19)- As the Celestial Ziran the Tester strode nearby Polaria, Druig came upon the idea to kill him, using the Celestials' weapon. He learned from torturing Sigmar that his own cousin Ikaris possessed the knowledge of the weapon's location, and after severely torturing Ikaris, learned it was found in the Pyramid of the Winds. Druig found the Weapon there, but as he prepared to fire it, Ikaris disintigrated him, killing him. The Weapon had already been set off, but fortunately, Ziran contained the Weapon's power, sparing the Earth from destruction. (Captain Marvel IV#5)- Within the Desecration Annex (a compound for those who have challenged the Celestials' authority), its servant, Godstalker, embroiled in a fight with Captain Marvel. Godstalker revealed that Druig was among those contained. Druig's energies are now used to empower the Godstalker to prevent anyone from releasing him. (Eternals III#4 (fb) - BTS) - Sprite used the power of the Dreaming Celestial to transform all Eternals including Druig into humans with false identities and memories. Druig became Ivan Druig, Prime Minister of Vorzheika. (Eternals III#2 (fb) - BTS) - Ivan Druig planned to abduct various American scientists and bring them to Vorozheika. (Eternals III#1) - Ivan Druig hired Sersi to plan a party for a list of exclusive guests to make them interested in Vorozheika. He gave her a budget of 200,000 dollars and a fee of 20,000 dollars. (Eternals III#2) - At the party Druig acted surprised when terrorists attacked to abduct the scientists, but the attack went differently as Druig had planned when the hired Russians were going to kill everyone at the party except for the scientists. (Eternals III#3 (fb) ) - The terrorists were stopped by Makkari (unaware of his true nature) and America's Next Super-Hero contestants Grace and Trucker. Druig left before the police arrived using his newfound powers. On his way out Druig killed a female police officer by mentally influencing her to choke to death. (Eternals III#3) - Druig went to his assistant Prykrish, who told him that they were looking for Druig after the party. Using his mental powers Druig forced Prykrish to reveal everything he needed to know. Druig learned from Prykrish where the abducted scientists were and that the Prosperity Party had decided to kill Druig because the saw him as a liability due to his connections to the old regime. Druig then forced Prykrish to commit suicide by shooting himself in the head. (Eternals III#4) - Druig returned to Vorozheika by plane and was arrested. He used his mental powers on his captors to push them over to his side and then decided to conquer Vorozheika. 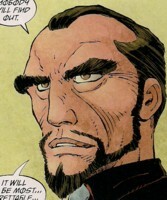 (Eternals III#5 - BTS) - Druig confronted the Vorozheikan Parliament and had those that had betrayed him captured. (Eternals III#5) - He brought the traitors to the other members of the Parliament and gave them the chance to show their loyalty by killing the traitors with box cutters. Parliament member Ivanovich tried to attack Druig instead and Druig forced him to cut his own throat. The others then accepted Druig's offer and killed the traitors. Druig saw how easy it was and decided to bring back the old ways with a secret police and persecution of minorities. Druig was later visited by Zuras and Ajak, who wanted his help. In return Druig demanded from them that they left him and his country alone forever and Zuras accepted the deal. (Eternals III#6) - Druig, Zuras and Ajak arrived in San Francisco where the Dreaming Celestial had awaken. Together with Ikaris, Thena and Seris they formed a Uni-Mind to talk to the Dreaming Celestial, but the Dreaming Celestial just turned them off as it was already talking to Makkari. Druig and the others soon regained consciousness. (Eternals III#7) - Druig joined the Eternals in the Antarctic when they were besieged by an army of Deviants. Alongside Ikaris and Ajak, Druig killed several Deviants. The Deviants left when their leader Kra realized that Makkari was really possessed by the Dreaming Celestials' spirit like Gelt had told him. Druig returned to Vorozheika to rule. (Eternals IV#1 (fb) - BTS) - Druig ordered to search for the Eternal Legba. (Eternals IV#1) - During a parade Druig was informed that Legba was found. Druig was angered that it took so long. Colonel Stoyanovich told Druig that it only took so long because Druig provided them with not enoug info on the subject. Druig assured the Colonel that he would continue them profiles for people the Colonel and his men should find, but they won't get more information on the subjects then Druig provided. Druig went to Ironton, Louisiana to meet with Legba, who had been reborn as Reverend Lester. Druig found him with a young woman and Legba and the girl mistook him for Satan. Druig then used his metal powers to awaken Legba's Eternal memories. Thena and Ikaris arrived and attacked Druig, who used his powers to push their car with Thena's son Joey into a lake. While Ikaris and Thena saved the boy, Druig and Legba escaped. (Eternals IV#2) - Druig gave a speech about gaining godhood for themselves by gaining control of the Dreaming Celestial. Legba and other Eternals that were willing to follow Druig were listening. Later Druig explained to Legba that the Dreaming Celestial was easy to hijack because it was cast out by the Celestials like they were cast out by the Eternals. Druig didn't want to reveal to Legba how he found him and only wanted their number to grow even further with Gilgamesh hopefully being the next addition to their ranks. (Eternals IV#4) - Druig and Legba were at a ballet when General Stoyanovich informed them that they had found Gilgamesh outside Goiana, Brazil. Gilgamesh attacked Druig and Legba when they arrived at his home because Ajak (though this wasn't reveled to Druig) had warned him. Druig's spine was shattered during the fight with Gilgamesh. (Eternals IV#5) - Two Brazilians tried to steal Druig's boots and he killed them without mercy. Unaware that Ajak was behind the trap, Druig was mad at Ikaris and went with Legba to the Antarctic. There they saw Ajak vaporize Makkari's body. (Dark Reign Files) - Quasimodo researched Druig for Norman Osborn. (Eternals IV#6) - Back in Vorozheika Druig met with his fellow Eternals when the Dreaming Celestial had iniatiated a fail-safe that put all mortals to sleep. Druig didn't like Akpaxa's suggestion to ask Zuras to compel Ajak to speak to the Dreaming Celestial and ended the meeting. On the roof Druig told Legba that he would rather die than to help stop the Dreaming Celestial and serve humanity for all time. The fail-safe ended when Makkari returned to life after Sersi replaced him in the Eternals' afterlife, the Lacuna. (Eternals IV#7) - Druig talked to Legba about the possible reasons behind Ajak's manipulation of Gilgamesh and how he had found him before them. Bothered by the Vorozheikans' screams Legba asked Druig to quiet them. 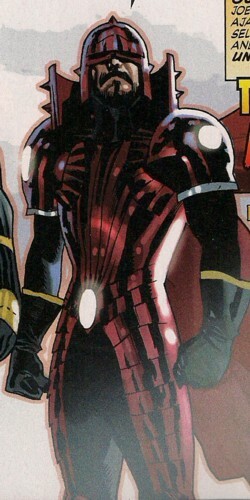 Suddenly Ikaris, who had been banished, appeared and attacked Druig. Along with his fellow Eternals (Pixie, Pannix, Vampiro, Legba, Akpaxa, Eramis) Druig fought back and Ikaris fled to San Francisco. Druig and his Eternals followed him only to tun into Ikaris' new allies the X-Men. (Eternals IV#8) - Druig and his Eternals fought Ikaris and the X-Men. Ikaris defeated Druig and asked him to join him, but Druig had other plans. When the Horde arrived on Earth Legba told Druig that he had to join Ikaris. (Eternals IV#9) - Druig and his Eternals worked together with Ikaris and the X-Men to fight the Horde. Druig told Ikaris that they had to move to the Dreaming Celestial and tap into his power to stop the Horde. Many Eternals that had been awaken by Ajak arrived at the Dreaming Celestial with Druig, Ikaris and a few other Eternals already waiting there. They formed the Uni-Mind to enter the Dreaming Celestial to fight the Horde. The Fulcrum, master of the Celestials, was impressed by the Dreaming Celestial's action against the Horde and they became companians. The Fulcrum restored Earth as it was afterwards. (Hulk III#49) - Druig was present in Antarctic home of the Eternals, Olympia, when Zuras discussed with the present Eternals the future of their race on Earth. Druig suggested not to feel guilty about having the greatest power and just accept that the planet belonged as much to them as to the other races. Ikaris corrected Druig that they weren't the ones with the greatest power anymore as they watched the Hulk (Thaddeus Ross) through Sersi's eyes battle a monster. After a fight between Hulk and Ikaris, who defended Sersi from the red brute, Zuras decided his future decisions would be less lightly than in the past and he demanded the other Eternals complete loyalty. Just think of Druig as the Loki of the Eternals' world. Oh, and why not visit Sersi's Loft? Profile by Prime Eternal. Upate by Markus Raymond. Or anyone else named "Druid".